I find it interesting to reflect on what triggers distance memories. Today as I was returning from an errand in my car my eye caught a look at a plastic bag that had become air borne and was wafting along in the sky. This vision immediately triggered a memory of kite flying when I was a youngster. 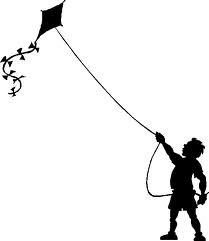 Each March of even later in the year I would be able to purchase a kite (or even make one) to fly in the fields of our farm. Getting the kite to fly stably in a brisk wind required some pretty big tails. My kite tails would be made with strips of old rags tied on a string extending from the bottom of the kite. With a bit of experimenting I could add just the right number of rags with the right spacing to hold the kite stable for the day's wind velocity. When I would get the kite as high in the sky as the amount of string I had available, I would stake the end of the string to the ground and even launch another kite if I had one. The next creative thing I used to do with kite flying was to launch parachutes from the kite string. With string and paper I would make a parachute weighted with either a nut or stone. At the top of the canopy I would add a bent pin or wire to serve as a loop to hang the parachute on the kite line. After placing the parachute on the kite line, the prevailing wind would blow the parachute up the line. After the parachute had risen to several hundred feet into the air it was time to launch the parachute. Triggering the launch was a bit difficult. The technique I used was to give the taut line a snap. A wave would proceed up the string and when it reached the parachute it would release the loop of wire from the string. The parachute would gently waft to ground delivering its load gently to earth. I took great pleasure from this play and the creative effort that it took to carry off this event. Perhaps this an indicator of my life to be as an engineer. All this makes me wonder about the play of my grandchildren and now great-grandchildren. As a child of the World War II era our generation fewer manufactured toys and gadgets available. Therefore we had to be more inventive in our play. We made our toys from whatever we had available. Maybe I need to demonstrate to my iPod, iPHone, and iPad grandchildren the joys of making a kite and parachute and launching a parachute from a flying kite string.